Life is fleetingly short. The minutes and seconds of our earthly lives are trickling down inexorably like grains of sand falling through the hourglass. Christ on his judgment seat holds the hourglass for each of our lives, watching, and waiting for that moment when we shall, at last, appear before him. Only he knows how many grains of sand of time are left for us. We must be ready at any moment. That is why Christ declares “behold, now is the day of salvation.” In a world where “all is vanity,” we must cut through the fog of sin and meaninglessness, and seize the weightiest of matters, in fact, the only thing that matters – the salvation of our souls. Jesus said what does it profit a man to gain the whole world but forfeit his life? Our goal is not this world or this life. Our goal is eternal life in the world to come. Jesus spoke of this often, comparing it to a wedding feast. In the great revelation given to St. John, he was caught up into heaven and beheld the joy of the saints at the wedding feast of Christ. An angel spoke to him “Blessed are those who are invited to the marriage supper of the Lamb.” (Rev. 19:9) St. John wrote about these blessed ones of the Church as the Bride of Christ, saying she “has made herself ready; it was granted her to be clothed with fine linen, bright and pure.” (Rev. 19:8) The saints are ready because of the way they are “clothed.” But, what is this clothing and why is it “fine linen, bright and pure?” Simply put, this is the divine, sanctifying grace of Jesus Christ. Time is short to be ready for the eternal wedding feast. The only thing that matters is that at the moment of death we are clothed with sanctifying grace. The opposite of being clothed is being naked. We find nakedness in the Garden of Eden. When Adam and Eve ate of the forbidden fruit, Original Sin, their eyes were opened “and they knew that they were naked.” (Gen. 3:7) They were exposed and ashamed before God. There is a curious scene too, in another garden, the Garden of Gethsemane, the night Jesus was betrayed and seized by the Roman soldiers. As all this happened, scripture says, “And a young man followed him, with nothing but a linen cloth about his body; and they seized him, but he left the linen cloth and ran away naked.” (Mk. 14:51-52) Sin has left us all naked and exposed to damnation. St. Paul spoke of this too, saying “Here indeed we groan, and long to put on our heavenly dwelling, so that by putting it on we may not be found naked.” (2 Cor. 5:2-3) Yet, it matters not what sins we may have committed in the past. Nothing is beyond the mercy of God, as long as we sincerely seek his forgiveness through the repentance of our sins. So, we must be clothed from on high by the Holy Spirit, but how? Sanctifying grace is conferred onto us through faith in Jesus Christ and the power of the Holy Spirit in the sacraments of the Church, which are necessary for our salvation. (CCC 1129) The seven sacraments of the Church are, of course: Baptism, Confirmation, Eucharist, Penance, Anointing of the Sick, Holy Orders, and Matrimony. These are the means by which we put on our wedding garments of fine linen, bright and pure. All of the sacraments are eminently efficacious and necessary for the life of the Church. However, I would like to focus here on just three sacraments, which are so necessary for the world today, and for our individual souls, and yet, are so sorely neglected. Jesus’ prayer from the Cross is apt “Father, forgive them; for they know not what they do.” Or, in our case, we know not what we squander. As far as we know, St. John was the only Apostle to hear these words from the Lord as he was crucified. He remained at the foot of the Cross, and did not flee like the other Apostles. He was the disciple whom the Lord loved. He was entrusted with the care of Mary the mother of God after Jesus died. He rested his head close to Jesus’ Sacred Heart at the Last Supper. He was the only Apostle not martyred, and so, lived to a wise old age, reflecting deeply for his whole life on the words of Christ. This deep meditation poured forth in the pages of his gospel when he wrote about the sacraments, especially Baptism, the Eucharist, and Confession. Three chapters later John writes about the Eucharist in the Bread of Life discourse. In it, Jesus says, “Truly, truly, I say to you, unless you eat the flesh of the Son of man and drink his blood, you have no life in you; he who eats my flesh and drinks my blood has eternal life, and I will raise him up at the last day.” (Jn. 6:53-54) The Eucharist is our food of immortality. Later in his gospel he writes about Confession and the power to forgive sins. He says about the Resurrected Jesus: “And when he had said this, he breathed on them, and said to them, “Receive the Holy Spirit. If you forgive the sins of any, they are forgiven; if you retain the sins of any, they are retained.” (Jn. 20:22-23) This sacrament of divine mercy renders us into a state of grace. Baptism, the Eucharist and Confession are so vital, so necessary in the everyday life of a soul. These are the channels of sanctifying grace by which we put on the wedding garments of Christ. To neglect these is to neglect the state of our souls, and to jeopardize our place of eternal life in heaven. This is the only thing that matters: When we die, will we be clothed in the wedding garments of Christ, or not? This requires us to earnestly pursue the weightiest of matters: repentance, conversion, sanctity, holiness, and saintliness. We are men and women of God, called to strive to enter through the narrow gate, to pray ceaselessly, to cling to the truth always, and to serve one another. The way of the disciple is to renounce the vanities of this world and to embrace the Cross of Christ. St. John quotes Christ in the Book of Revelation about keeping our garments white and clean: “He who conquers shall be clad thus in white garments, and I will not blot his name out of the book of life; I will confess his name before my Father and before his angels.” (Rev. 3:5-6) And again, concerning our garments and Christ’s Second Coming: “Lo, I am coming like a thief! Blessed is he who is awake, keeping his garments that he may not go naked and be seen exposed!” (Rev. 16:15) It is up to us to keep our wedding garments of fine linen, bright and pure. We do this by taking refuge in the sacraments of the Church; and going to Confession frequently, and receiving Jesus in the Holy Eucharist often. This entry was posted in Baptism, Confession, Eucharist and tagged Baptism, confession, Eucharist, garments, grace, Holy Spirit, Penance, Revelation, Sacred Heart of Jesus, salvation, sanctifying grace, souls, St. John, the only thing that matters on September 11, 2017 by Brian. It is not a coincidence that the feast day of the Sacred Heart of Jesus comes in the liturgical calendar just after Pentecost, commemorating the gift of the Holy Spirit. The Holy Spirit proceeds from the depths of Jesus’ Heart. The feast of the Sacred Heart is also the first Friday within the Octave of Corpus Christi, celebrating the real presence of Jesus’ body and blood in the Eucharist. This is fitting, as the Sacred Heart of Jesus is part of His physical body. In that sense, when we receive the Eucharist, we are receiving the Sacred Heart of Jesus. (H.A. 122) The blood that pours forth from His pierced heart at Calvary symbolizes the “blood of the new covenant” that Jesus offers up at the Last Supper, in which we partake at every Mass. By the 17th century, the Faith was in tumult, particularly in France, dealing exteriorly with the Protestant Revolution and interiorly with the Jansenist heresy. Jansenism denied the free will of man, advocating that only those predestined by God would receive sanctifying grace. These teachers purported a moral rigorism, resulting in many people being denied Holy Communion due to their faults and sins. It was against the backdrop of this narrow worldview, constricting the sacraments of grace to only a few, that Jesus appeared to St. Margaret Mary Alacoque and said, “Behold this Heart, which has loved men so much, that It has spared nothing, even to exhausting and consuming Itself, in order to testify to them Its love.” Jesus shows that He offers Himself up, not for a few, but for the love of all people, and desires them to receive Holy Communion frequently. He requested that a feast day be established in honor of His Sacred Heart, and that people should go to Holy Communion on the first Friday of every month, as well as regularly keeping Holy Hour adoration. Jesus did, in fact, renew the life of the Church, enlivening the hearts of believers, with this devotion to His Sacred Heart. Jesus also made a number of famous promises (more than the generally assumed twelve promises) to St. Margaret Mary regarding those who would have a devotion to His Sacred Heart. These included, among others, bringing peace to their families, consoling them in their troubles, granting them all the necessary graces in their lives, helping them become more fervent and perfect in their faith, and inscribing their names on His Heart forever. In a letter from May 1688, St. Margaret Mary wrote about “the Great Promise” that Jesus told to her. He said, “I promise you that My all powerful love will grant to all those who will receive Communion on the First Fridays, for nine consecutive months, the grace of final repentance.” As wonderful as this promise is, we should remember this is not an automatic guarantee to heaven. We should discern away any superstition involved with this. As Fr. James Kubicki, S.J., the National Director of the Apostleship of Prayer, writes this is “not magic but the natural consequence of a life lived in union with the Heart of Jesus.” We are not called to superstition, but to devotion. Our devotion to the Sacred Heart is most fully expressed in our devotion to the Church. The blood and water of the Eucharist and Baptism make us anew. His Spirit dwells within us giving us eternal life. This is the fulfillment of the great prophecy of Ezekiel. The scripture says, “And I will give them a new heart, and put a new spirit within them; I will take the stony heart out of their flesh and give them a heart of flesh.” (Ez. 11:19-20) And so it is with us. Our hearts are conformed, and remade, in the sacraments to the Sacred Heart of Jesus. As Jesus hung on the Cross, He cried out “I thirst.” In the lens of Christianity, Jesus’ thirst is to save souls. We can in a very real way console the Sacred Heart of Jesus and His thirst to save souls, through our reparation and devotion to His Sacred Heart. (Miserentissimus Redemptor, 13) Properly understood, Baptism and Eucharist transform us, who partake in them, into the Body of Christ. Through the life-giving waters of Jesus we are made clean, and through His body and blood we are transformed. In this, the beloved disciple, St. John, is our example; resting our heads on the breast of Jesus, listening closely to the sublime beats of His Heart, He makes us new creations. This entry was posted in Baptism, Eucharist, Sacred Heart and tagged Baptism, blood, blood and water, devotion, Eucharist, Ezekiel, feast of the Sacred Heart, Haurietis Aquas, Heart, Isaiah, Jansenism, Jesus, life giving water, Miserentissimus Redemptor, promises, sacred heart, Sacred Heart of Jesus, St. John, St.Margaret Mary, water on June 2, 2016 by Brian. It is not a coincidence that the feast day of the Sacred Heart of Jesus comes in the liturgical calendar just after Pentecost, commemorating the gift of the Holy Spirit. The Holy Spirit proceeds from the depths of Jesus’ Heart. The feast of the Sacred Heart is also the first Friday within the Octave of Corpus Christi, celebrating the real presence of Jesus’ body and blood in the Eucharist. This is fitting, as the Sacred Heart of Jesus is part of His physical body. In that sense, when we receive the Eucharist, we are receiving the Sacred Heart of Jesus. (H.A. 122) The blood that pours forth from His pierced heart at Calvary symbolizes the “blood of the new covenant” that Jesus offers up at the Last Supper, and which we partake in at every Mass. One of the great Eucharistic miracles in the history of the Church is the miracle of Lanciano. This happened in the 700’s in Lanciano, Italy at a monastery, interestingly enough, under the patronage of St. Longinus, who is traditionally believed to be the Roman centurion that pierced Jesus’ side with his lance. In the miracle, a doubting monk was offering up the Sacrifice of the Mass, and at the consecration, the bread and wine turned visibly into real flesh and blood. Although centuries old, and never hermetically sealed or stored with preservatives, the specimens never deteriorated. In 1981, with the permission of the pope, a major scientific examination was done on the relics to determine their true nature. The results came back that the samples are real human blood and flesh. Moreover, the flesh was determined to be myocardium of a heart wall and endocardium tissue of a heart cavity. The Eucharistic miracle revealed true flesh and blood of a human heart. Yet, in the 17th century Church, particularly in France, human hearts had grown cold and become stony hearts. The faith was in tumult, dealing exteriorly with the Protestant Revolution and interiorly with the Jansenist heresy. Jansenism denied the free will of man, advocating that only those predestined by God would receive sanctifying grace. They taught a moral rigorism, resulting in few people receiving Holy Communion due to their faults and sins. It was in this narrow worldview, constricting the sacraments of grace to only the few, that Jesus appeared to St. Margaret Mary Alacoque revealing, for all, His Sacred Heart, saying, “Behold this Heart, which has loved men so much, that It has spared nothing, even to exhausting and consuming Itself, in order to testify to them Its love.” Jesus shows that He offers Himself up for the love of all people, and desires them to receive Holy Communion frequently. He requested that a feast day be established in honor of His Sacred Heart, and that people should go to Holy Communion on the first Friday of every month, as well as regularly keeping Holy Hour adoration. Jesus did, in fact, renew the life of the Church, enlivening the hearts of believers, with this devotion to His Sacred Heart. Jesus also made a number of famous promises (more than the generally assumed twelve promises) to St. Margaret Mary regarding those who would have a devotion to His Sacred Heart. These included, among others, bringing peace to their families, consoling them in their troubles, granting them all the necessary graces in their lives, helping them become more fervent and perfect in their faith, and inscribing their names on His Heart forever. In a letter from May 1688, St. Margaret Mary wrote about “the Great Promise” that Jesus had spoken to her. He said, “I promise you that My all powerful love will grant to all those who will receive Communion on the First Fridays, for nine consecutive months, the grace of final repentance.” As wonderful as this promise is, we should remember this is not an automatic guarantee to heaven. We should discern away any superstition involved with this. As Fr. James Kubicki, S.J., the National Director of the Apostleship of Prayer, writes this is “not magic but the natural consequence of a life lived in union with the Heart of Jesus.” We are not called to superstition, but to devotion. This devotion is also related to the Divine Mercy devotion. 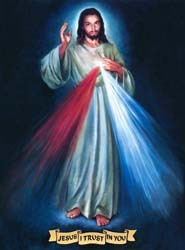 The Divine Mercy image shows red and white light emanating from Jesus’ Heart. Many have linked this, again, to the blood and water from the piercing of Jesus’ Heart, and the grace from the blood of the Eucharist and the waters of Baptism. The Divine Mercy prayer makes this link explicit to Jesus’ Heart: “O Blood and Water, which gushed forth from the Heart of Jesus, as a fount of mercy for us, I trust in You.” (Diary, 84) The devotions to the Sacred Heart of Jesus and the Divine Mercy are very much related and similar, with difference only in emphasis. The blood and water that flowed out of Jesus’ Sacred Heart at the Crucifixion remind us of the sacramental and sanctifying grace of the Church. With the blood of the Eucharist for redeeming and the water of Baptism for cleansing, we are brought into supernatural life through the power of the Holy Spirit. The Sacred Heart is the chief symbol of this divine love of the incarnated God and His Sacred Humanity. (H.A. 54) Properly understood, Baptism and Eucharist transform us, who partake in them, into the Body of Christ. This is a fulfillment of the great prophecy of Ezekiel. The scripture says, “I will sprinkle clean water upon you, and you shall be clean from all your uncleannesses… A new heart I will give you, and a new spirit I will put within you; and I will take out of your flesh the heart of stone and give you a heart of flesh. And I will put my spirit within you..” (Ez. 36:25-27) Again, Ezekiel says, “And I will give them a new heart, and put a new spirit within them; I will take the stony heart out of their flesh and give them a heart of flesh.. and they shall be My people, and I will be their God. (Ez. 11:19-20) Through the life-giving waters of Jesus we are made clean, and through His body and blood we are transformed. God gives us a new heart, and a new spirit. Our hearts of stone are transformed through the divine love of His Sacred Heart. The beloved disciple, St. John, is our example; we can rest our heads on the breast of Jesus, listening closely to the sublime beats of His Heart, making us anew. This entry was posted in Baptism, Eucharist, Sacred Heart and tagged Baptism, blood, blood and water, Eucharist, Ezekiel, First Fridays, Haurietis Aquas, Heart, hemorrhagic, Isaiah, Jansenism, Lanciano, miracle, Miserentissimus Redemptor, pericardial, sacred heart, Sacred Heart of Jesus, St. John, St.Margaret Mary, water on June 2, 2016 by Brian. The sacrament of Baptism initiates us into the mystery of Christ. It is the essential rite to eternal life, and the beginning point of the whole Christian experience. (CCC 1213) In Baptism, God first demonstrates His self-communication to us. It imprints His indelible mark upon our souls configuring us to the life, death, and resurrection of Jesus Christ. The character of Christ is irrevocably sealed upon our minds and souls, configuring us to a new and eternal spiritual reality. (CCC 1272) It transforms who we are. A permanent ontological change takes place to our very being. Just as a material object or person is visibly sealed with a mark, defining who or what it is, or whose property it might be, so too, in Baptism, God marks our immaterial souls invisibly and permanently, claiming us as His own. It sets us apart. It can only be done once, and nothing can undo it. It is a necessary transformation. Jesus attests to it, saying, “Very truly, I tell you, no one can enter the kingdom of God without being born of water and Spirit.” (Jn.3:5) Baptismal water is a graced sign, a real symbol, which efficaciously applies the invisible grace it signifies. It does in reality, the sign it points to. We are washed of Original Sin, purified of all of our sins, and regenerated to eternal life. It consecrates us into the sacramental character of Christ’s paschal mystery, impressing upon us His saving grace of the Cross. (SC, 6) We are sealed with Christ’s imprimatur, conforming us to the God-man. (2 Cor. 1:21-22) He alone conquered sin, and death itself, so that by faith and grace, we too, who are flesh and blood mortals, may partake in His supernatural life. Baptism is necessary because Christ alone overcame death. We need His divine life in us, so we too will rise to eternal life. Baptism anticipates our own resurrection. Through it, we are grafted into communion with the Easter mysteries. The mystery of Christ becomes alive to us, and in us. Christ in His life, and in His Passion and suffering, and all that He was in His eternal and divine humanity, begins to unfold and live out in our individual lives. When we are immersed into the water, we are brought into His death, and rising from the water, we are brought into His life and resurrection. (Rom. 6:3-4) As the Catechism says, “It signifies and actually brings about death to sin and entry into the life of the Most Holy Trinity through configuration to the Paschal mystery of Christ.” (CCC 1239) We are made into a new living, Trinitarian reality; spiritually reordered towards the Father, configured to the Son, and filled with the Holy Spirit. We become adopted children of God, by faith and grace; baptized into the Son of God, we are made partakers in the divine nature by proxy, as He is in reality. We are indeed remade into this new holy status as children of God, and temples of the Holy Spirit, and co-heirs with Christ. It makes us, first and foremost, Christian, and members of the Church, the Body of Christ, and gains us access to divine grace in the rest of the sacraments. It is our foundation for the supernatural life. But, it is also the first moment of a lifelong phenomenon of conversion. Baptism is more than just a single event, or a static state; it transforms us in such a way that we are perpetually drawn deeper into the living reality of Christ. It allows us to engage in the sacramental life and realize the mysteries of Christ in our being. It establishes a new dynamic in our consciousness, where our everyday circumstances are reinterpreted and contextualized within the divine humanity of Christ. Our humanity is elevated and divinized. We are afforded special offices. One of these is our incorporation into the common priesthood of the faithful, the baptized, and the ordinary. With a sacred chrism, the oil consecrated by the bishop, the newly baptized is anointed into Christ as “priest, prophet, and king.” (CCC 1241) We become sharers in Christ’s one eternal priesthood. As Lumen Gentium, the Dogmatic Constitution of the Church, says, “The baptized, by regeneration and the anointing of the Holy Spirit, are consecrated as a spiritual house and a holy priesthood.” (LG, 10) Even as Christ is the one true and eternal Mediator between God and man, He still graciously saw fit that we should also participate, to varying degrees, in His priestly office. As part of our baptismal right and dignity, we can exercise that priestly office by virtue of our association in Christ’s life, passion, and redemptive sacrifice. But, what are our priestly functions? Scripture and the Church say we are to make spiritual sacrifices. We are to offer up interiorly all of our actions, words, deeds, suffering, successes, and all that we do, for the glory of God and for the intercession of souls. The magisterium teaches that the baptized should “present themselves as a living sacrifice, holy and pleasing to God.” (LG, 10 ) Every common thing in our ordinary existence can be extended towards God as a sacrifice in our common priesthood. We can offer up everything, including our prayers, sacrifices, fasting, bodily weaknesses, illness, even patiently enduring the things that annoy us, or nearly anything that may otherwise seem useless and worthless in the eyes of the world. God’s eternal priesthood is mediated in the implements of our material world. Our physical operations can have spiritual significance. We can exercise our priesthood, in such a way, that we can, in effect, “sacramentalize” all that we do. That is, we spiritualize our activity through faith and with the intention of offering reparation to God. This is how we become living sacrifices. As the magisterium explains, we can “exercise that priesthood in receiving the sacraments, in prayer and thanksgiving, in the witness of a holy life, and by self-denial and active charity.” (LG, 10) By ourselves, a branch separated from the vine, our actions have no spiritual power. But, united with Christ, in the power of the Holy Spirit, our actions can be spiritually efficacious for reparation of our sins and the sins of others. This is our role in the communion of saints. We are mediators. Through initiation in Baptism and the imprinting of Christ’s priestly seal upon us, we become priests. We can use our willful intention to please God, in a particular activity, invoke the anointing of the Holy Spirit, and raise that up as a form of worship. So, we can, for illustration, use our being hungry on any given afternoon, or say, being stuck behind a slow driver in our morning commute, to invoke the Holy Spirit, and offer these annoyances up to God for the sanctification of souls. These are just two minor examples, but the possibilities are nearly endless. St.Paul explains these spiritual sacrifices. He says, “I am now rejoicing in my sufferings for your sake, and in my flesh I am completing what is lacking in Christ’s afflictions for the sake of his body, that is, the church.” (Col.1:24) Christ deemed us worthy to take part in His priestly ministry, and left for us a portion of the redemption to offer up to the Father. He made us a living Church, actively carrying on His mission. Christ’s presence and power remain hidden now sacramentally, just as it did in His life then when He walked the earth. Some people today see just bread and wine, and not the body and blood of Christ, as before they saw just the carpenter’s son, and not the Son of God. Christ continues His priestly mediation for the world today through us. In this vein, St.Paul is dutifully acting out his priestly character. He offers intercession and mediation for the Church, through his own sufferings, in unity with the sufferings of Christ. We are called to do the same. Christ has deputized us. He appointed us His priests. It is our role to live as mediators and intercessors here on earth in imitation of Him. We are to stand in the breach for those entrusted to us. Baptism is everything, but it’s also just the beginning. This entry was posted in Baptism, Catechism of the Catholic Church (CCC), Common Priesthood, Spiritual Sacrifices and tagged anoint, Baptism, Catechism of the Catholic Church, character, Common Priesthood, eternal life, Father, indelible sign, paschal, priest, priesthood of the faithful, sacrament, sign, Son and Holy Spirit, spiritual, symbol on October 15, 2015 by Brian. Do you know that you are a priest? Many of us Catholics are unaware of our own priesthood. Yet, this office of priesthood was conferred upon us in the Sacrament of Baptism, and later again, reaffirmed in the Sacrament of Confirmation. Of course, most of us are far more familiar with the first aspect of the Baptismal rite. That is, when we are immersed into the baptismal water, or the water is poured over our heads – and we’re blessed three times in the Name of the Father, and the Son, and the Holy Spirit. By this sacred rite, we are made into “a new creation” (Rom.5:17), our sin forgiven, and “grafted into the paschal mystery of Christ.” (Sacrosanctum Concilium 6) For as Jesus said, “Amen, amen, I say to you, no one can enter the kingdom of God without being born of water and Spirit.” (Jn 3:5) However, there is a second aspect to the Baptismal rite, in which we are anointed with the holy chrism oil. Then, as the holy unction is applied to our heads, the priest or deacon prays over us, “As Christ was anointed priest, prophet and king, so may you live always as a member of His holy people, sharing everlasting life.” And with that anointing, we become sharers in Christ’s threefold offices of priest, prophet and king. In particular, a share in the eternal priesthood of Christ is stamped upon our souls. This is not a metaphorical or allegorical priesthood, but a true priesthood; Christ’s priestly character is indelibly marked upon our souls. We should absorb this idea to the very core of our being: You are a priest! The priesthood of the faithful is not an obscure idea. The Magisterium itself spells out the priestly nature of our Christian vocation. The Catechism refers to the “whole community of believers” that “through the sacraments of Baptism and Confirmation” are “consecrated to be ..a holy priesthood.” (CCC 1546) We, as Catholics, are definitely use to thinking of a strict separation of powers between the ecclesiastical hierarchy and the laity; the former, with priestly powers, and the latter, without. Part of this is from the emphasis, and perhaps over-correction, by the Church and the Council of Trent in response to the Protestant Reformation. Martin Luther and the Protestants of the 16th century rebelled, of course, against the Catholic hierarchy and the validity of the Sacraments, among other things. In defense, and rightly so, of Apostolic succession, the Priesthood and the Sacraments, some of these ideas, such as a priestly community of believers, were somewhat forgotten. Now, centuries later, this is part of the spirit of Vatican II in trying to recover these long-faded notions and empowering the laity. Documents such as Lumen Gentium, the “Dogmatic Constitution on the Church,” and later, Pope John Paul II’s Christifideles Laici, or “The lay Faithful,” are attempts, partially, at retrieving this common priesthood of the faithful. Of course, this idea goes back way beyond the Middle Ages too. It goes all the way back to the Apostles and the Bible itself. Even St.Peter, the chief Apostle, passionately implores us as if we could hear him now, “..and, like living stones, let yourselves be built into a spiritual house to be a holy priesthood to offer spiritual sacrifices acceptable to God through Jesus Christ.” (1 Pet.2:5) Later, he again tries to impress upon us, and emphatically so, the ontological nature of who we truly are, “But you are ‘a chosen race, a royal priesthood, a holy nation..’” (1 Pet.2:9) This is unequivocal and direct. It should really shake us to our foundation, and awaken us from any stupor that there’s nothing special in being a Christian. We should remind ourselves often of our dignity through Christ. Clearly, this was not a foreign concept to the Apostles then or to the Magisterium now. It is a consistent dogma understood throughout the history of the Church: all baptized believers are priests of Christ. But then, what does it mean to be a priest? And how do we, as the laity, exercise this common priesthood today? The Protestants of the 16th century clearly committed a grave error in dismissing the ecclesiastical priesthood. As the saying goes, they threw the baby out with the bath water, or in this case, they gutted the Church to undo some Clericalism. Yet, in a sense, as bad as that is, they helped to restore, perhaps indirectly over time, the charism of the lay faithful. Now, there are two participations – which we Catholics understand to differ, in essence – in the one priesthood of Christ: One being the ministerial or hierarchical priesthood of bishops and priests; and the other, the common priesthood of the faithful. The ministerial priesthood is at service to the common priesthood by building up and leading the Church, and administering the Sacraments. Moreover, the ministerial priest, by virtue of Holy Orders, acts “in persona Christi Capitis.” (CCC1548). That is, Christ Himself – in the priest – is present to His Church. Yet, we the laity, are also priests. We participate in both the one, eternal priesthood of Christ as well as the salvific mission of the Church. But, how to do this? As the New Evangelization is calling us, we have to rediscover, if you will, the way the first apostles and disciples lived this common priesthood. As priests, we are to offer praise and sacrifice to God in intercession for ourselves and for the salvation of others. We are to be charitable. And so, in a very real way, we can offer mediation for the sins and unbelief in ourselves and members of our family, our friends, or really anyone in the world, or in purgatory for that matter. Our lives should be a dynamic interaction of presenting ourselves to God through holiness, prayer and sacrifice. St.Peter’s instruction should be our mantra; to be a “royal priesthood,” by building up ourselves as “spiritual houses,” and offering “spiritual sacrifices.” This is the key to our common priesthood of the faithful. This entry was posted in Baptism, Common Priesthood, Sacramental life and tagged Baptism, Catholic catechism, Common Priesthood, laity, lay faithful, Sacramental life, Vatican II on August 18, 2015 by Brian.